china's stupendous success in exploiting bamboo for economic gains appears to have prompted India to follow suit. The heightened interest in this tallest member of the grass family is reflected in the latest Union budget. As per one of the proposals, a special project on bamboo applications -- undertaken by the Technology Information Forecasting and Assessment Council (tifac) -- is to receive an almost nine-fold increase in funding. As against Rs 5 crore in 2002-2003, the programme has been allocated Rs 43 crore in the next financial year. tifac is an autonomous body under the department of science and technology (dst). The project is one of a dozen mission-mode bamboo-related programmes, which have been drawn up by the Planning Commission. According to D N Tiwari, member (science), Planning Commission, India plans to spend around Rs 500 crore per year over the next five years on developing new bamboo-based products and in improving the existing ones. V S Oberoi, in charge of the tifac bamboo project, reveals that around Rs 12 crore will be used to evolve standards for bamboo products for construction, handicrafts and industrial applications. He adds that the funds allocated in the previous financial year have been primarily spent on developing technologies for bamboo-based composite materials, activated carbon and bamboo shoots. "We also plan to launch bamboo as a solution for areas as diverse as housing, nutrition, employment and environment," says Tiwari. Keeping these objectives in mind, several micro-missions on bamboo applications involving 41 institutions have been initiated. Among these bodies are the Pune-based National Chemical Laboratory (ncl) and the Central Food Technological Research Institute (cftri), Mysore. While the former scored a first by propagating bamboo through tissue culture, the latter is working on food products such as cornflakes, chocolates and beer based on edible bamboo. An additional area of two million hectares will also be brought under bamboo plantations. India is also eyeing the international market for edible bamboo shoots, which is currently monopolised by China and Thailand. Though Thailand accounts for around 40 per cent of the global bamboo market, it is in a precarious state today. The country's main edible bamboo variety is supposed to flower in the next year or two. And as the entire bamboo grove dies after flowering, Thailand's would be adversely affected. This is good news for India as it would get a launching pad to enter the bamboo shoot market. Not everyone shares the Planning Commission's enthusiasm on bamboo, though. Parimal Chandra Bhattacharjee of Guwahati University points out that unless effective marketing measures are adopted, a glut could result. 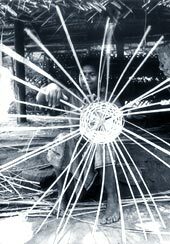 This in turn would lead to a price slump, adversely affecting small stakeholders such as weavers and handicraft manufacturers.